The hotel is a short walk to the village of Spich and the nearest train station. Cologne-Bonn Airport is only 9 km away, while Cologne Cathedral is 20 km from the establishment. Cologne and Bonn offer visitors great recreational activities such as the chocolate, art and history museums, Phantasialand and riverboat trips. The hotel comprises 110 non-smoking rooms spread across 5 floors, as well as a number of facilities.Â Â Parking is available for those arriving by car and corporate travellers are invited to make use of the well-equipped business centre. Guests are able to have a drink at the cosy bar while watching TV, or simply relax in the sitting area and enjoy pleasant conversations. The modern rooms all come with individually adjustable air conditioning and complimentary tea/coffee making facilities. Free wireless Internet access and satellite TV provide in-room entertainment. City centre - 20.000 Km. Bus/Train station - 2.500 Km. Nearest Bus / Metro Stop - 20.000 Km. Golf course - 3.000 Km. 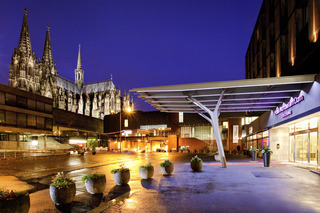 This city hotel is centrally located in Cologne's media park. The hotel is just a 10 minutes' waking distance away from the cathedral and is situated within easy access of this enchanting city's captivating attractions. The nearest train station is located just 5 minutes from the hotel, offering ease of access to other intriguing areas to be explored. Cologne airport is conveniently situated just 20 kms away from the hotel. Guests are welcomed into contemporary surroundings which enjoy an elegant style in which to relax and unwind in comfort. Guests will appreciate the comfortable environment of the beautifully-decorated guest rooms which come complete with modern amenities for guests' convenience. Guests will be impressed by the hotel's choice of leisure facilities which have been designed with the ultimate relaxation and pleasure in mind. City centre - 2.000 Km. Bus/Train station - 2.000 Km. Nearest Bus / Metro Stop - 1.000 Km. Entertainment Area - 1.000 Km.